Avery F. Shore, 73, St. Francis Hotel, died in Kansas City, Mo., Monday afternoon a few minutes after he suffered a heart attack. Mr. Shore was born at Mt. Caroll, [sic] Ill., May 23, 1882, the son of the late Jemmison [sic] and Ellen David [sic] Shore. His boyhood was spent in Illinois and in his early life he lived at Versailles. He was married at California, Mo., April 12, 1902, to Miss Clara Hays. They came to Sedalia to make their home 37 years ago. Mrs. 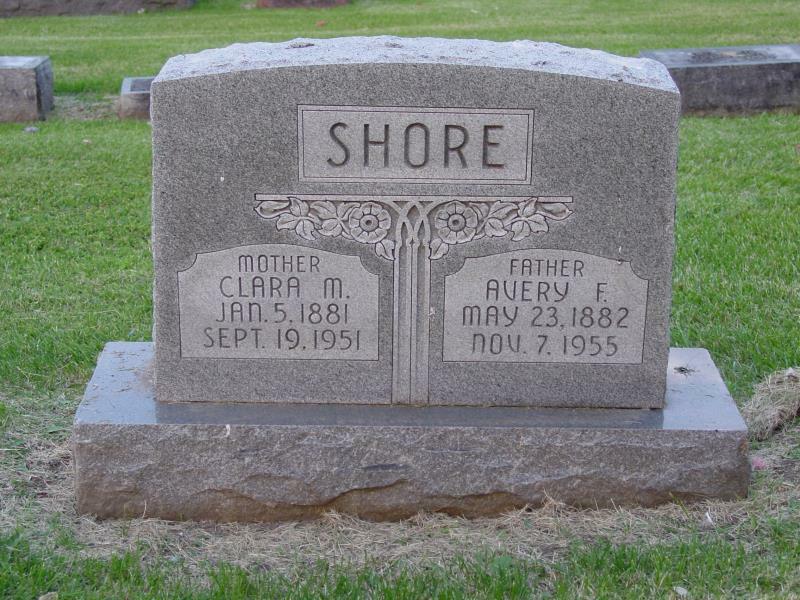 Shore died September 19, 1951. Until his retirement several years ago Mr. Shore was employed at the Missouri Pacific shops. Surviving are: five daughters, Mrs. Edith Evans, 630 Wilkerson; Mrs. Maude Cronic, Bloomington, Ill.; Mrs. Josephine Workman, St. Louis, Mo. ; Mrs. Bonnie Chandler, Sedalia and Mrs. Virginia Bartlett, St. Joseph; one son, Howard Shore of Texarkana, Tex. ; three brothers, John of Los Angeles; Rube and Cline [sic] J. Shore, Versailles; 14 grandchildren and 11 great-grandchildren. Funeral services will be held at the Ewing Funeral Home at 2 p.m. Wednesday. The Rev. Ralph E. Hurd, pastor of the Epworth Methodist Church will officiate. — From The Sedalia Democrat, Sedalia, Missouri, Tuesday, November 8, 1955. Transcribed by Brett Mueller, 20 October, 2007. Funeral srevices [sic] for Avery F. Shore, 73, St. Francis Hotel, who died in Kansas City Monday afternoon, were held at the Ewing Funeral Home at 2 p.m. Wednesday. The Rev. Ralph E. Hurd, pastor of the Epworth Methodist Church, officiated. Mrs. F. O. Withers and Mrs. Charles Hurtt sang, “The Last Mile of the Way,” and “Going Down the Valley,” accompanied by Mrs. Mae Moser at the organ. Burial was in Crown Hill Cemetery. — From The Sedalia Democrat, Sedalia, Missouri, Wednesday, November 9, 1955. Transcribed by Brett Mueller, 20 October, 2007. The obituary copy is somewhat difficult to read, and a few of the numerals were difficult to discern. I think I transcribed them correctly, but I may have inadvertently introduced errors. Avery Fillmore Shore was my g-grandfather. Although the obituary lists heart attack as the cause of death, the death certificate lists cause of death as unknown.